Cheeky Boots Haul and Daily Look! So as I mentioned in my earlier, rather contemplative post, I had a bit of a mooch around town by myself today. It turned into a much more expensive day than I had anticipated, but I will get to that later! I think I looked rather bangin’ today, if I do say so myself. 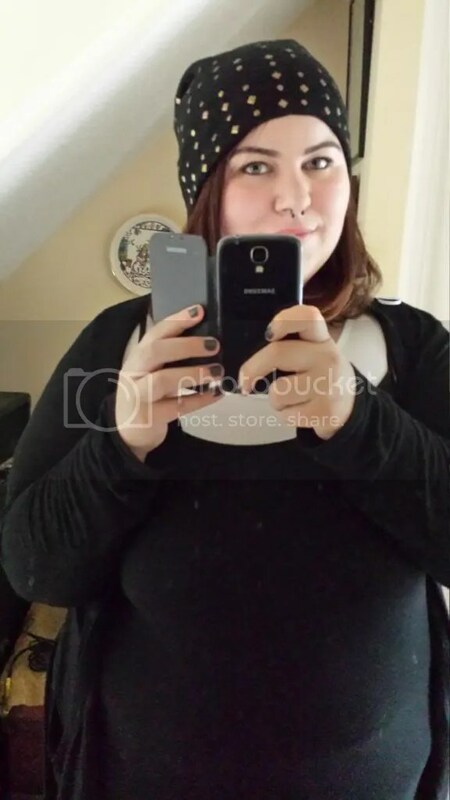 It was fairly cold and rainy, and my hair was NOT behaving, so I plonked a studded beanie I got from ASOS last year on my head and decided to roll with it. Begrudgingly I have to admit I think my hair is currently at the perfect beanie-length, but I would like it to grow a bit more before I think I’ll be happy with it. For the time being, anyway! Quickly I would like to mention my nail polish- you can just about make out the awesome, interesting grey colour here! It’s MUA nail polish in Bullet, one of their newer shades, and it is AMAZING. I applied it last Sunday and it has only JUST started chipping the tiniest bit on three nails. And I didn’t apply any top coat. Now it might be because I keep my nails ludicrously short (been playing cello since I was 7, cannot do long fingernails any more, it freaks me out!) but still, for a nail polish that only cost me £1 I’d say that was bloody brilliant! 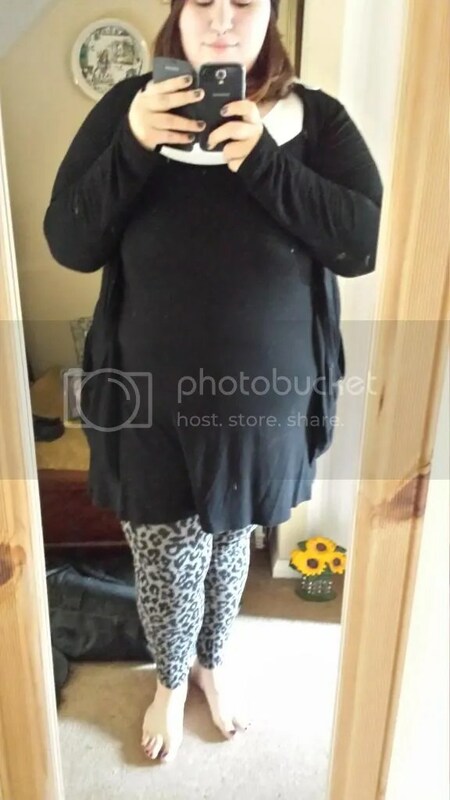 I wore a black strappy dress (with a white t-shirt underneath) from New Look, with a black open front cardigan (also from New Look) and my trusty leopard print Matalan leggings. A hole has been discovered in these- disaster! I also wore one of my favourite necklaces, a vampire-teeth one from Claire’s Accessories that is identical to a necklace I’ve been eyeing up from Attitude catalogue for ages but would have cost double the price. Finishing it all off was my fake Doc Marten style boots. I bought a few bits from Primark, but the main gist of what I bought (and what I had gone specifically to buy) was from Boots. 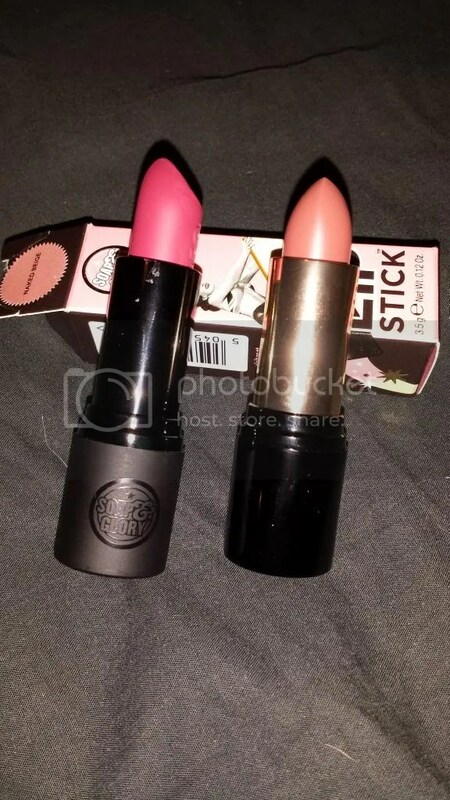 Miss Budget Beauty had featured Soap & Glory’s Pom Pom lipstick on her blog in the past couple of days and like me, she is a matte lip fan so my ears pricked up and I read her review with great interest. When I got to Boots and had placed my first intended purchase in my basket (Real Techniques Total Face brush), I turned to the Soap & Glory stand (quite literally, as the brushes and S&G stand are opposite each other on an aisle in my local Boots!). There I saw it- Buy 1, Get 1 Half Price across all Soap & Glory cosmetics. And I couldn’t resist! 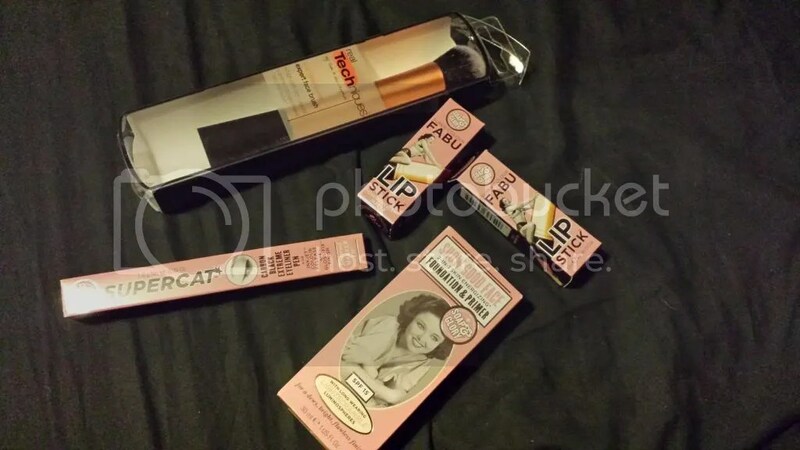 I bought the aforementioned Super Colour Fabulipstick Powdercoat in Pom Pom, as well as a Super Colour Fabulipstick in Naked Beige, Supercat Liquid black eyeliner pen and Show Good Face 2-in-1 Skin Energizing Foundation and Primer in The Fairest of Them All. I already have a Supercolour Fabulipstick in Guavarama, so I know that I like the original formula. These look beautiful in the bullet; I really like the fact that the glossier formula is in a glossy case, whereas the Powdercoat Matte lipstick is in a matte case. Easy to differentiate when rooting in my make up drawer! 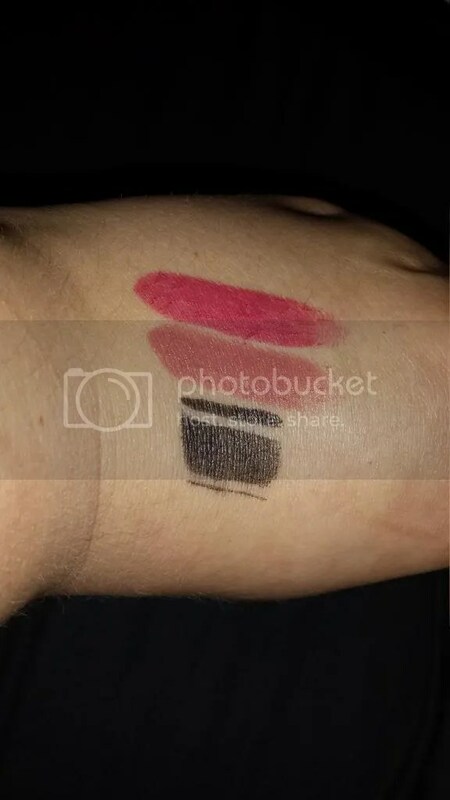 Here’s a quick swatch of the two lipsticks and the eyeliner. I’ve also tried them on quickly and they are both BEAUTIFUL. I love the pinkiness of Pom Pom, and the finish is something else! The eyeliner is also pretty awesome, and dries almost instantly, and whilst it’s very long lasting it’s not too much of a pain to remove either. Always good! 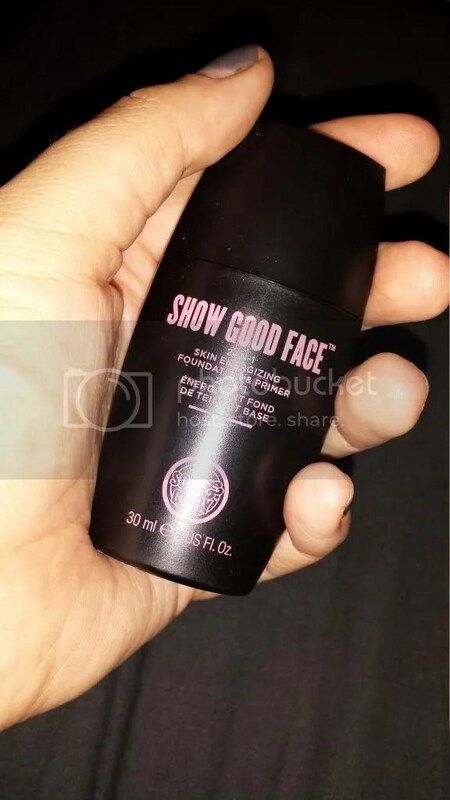 The foundation seems to be in a very small bottle for what I paid, but I guess 30ml is a fairly average amount to have in a foundation so I can’t complain really. It’s actually dispensed through a very neat, small nozzle and you squeeze the bottle a little to get it out. I can imagine it’ll be a pain when there’s not much left, but never mind! Something else I bought today (well, had to) was an unexpected pair of glasses. I had taken a £5 eye test voucher for Specsaver’s with me, and when I went to make an appointment they were able to fit me in later that afternoon. So I mooched around a bit longer and then went for my test. It was just meant to be a quick check up as it’s been five years since I last had them tested, and I thought I better check it was all still good. Well, good bloody job I did! I walked out over an hour later having paid my £5 for the test, but also £69 for a new pair of glasses as it turns out I have astigmatism in my right eye! Amazed that they never picked up on that before but there you go! I have my new prescription so what I will do is see if I can get a friend of my dad’s, who happens to make glasses (he actually made Harry Potter’s glasses for all the films, how awesome is that? ), to see if he can put my new prescription in my old glasses and fit new lenses into some clear ones I bought a few weeks ago. I couldn’t resist getting a new pair, though, and they had a deal on where I could either get two pairs for the price of one, or free anti-glare lenses with my pair. And I really like the pair I got too, so when I pick them up next Saturday I will make sure to show you all! 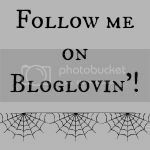 This entry was posted in Beauty, Hair, Makeup, Daily Look, Fashion- High Street, Lifestyle and tagged astigmatism, boots, daily look, Glasses, haul, New Look, Soap & Glory, Specsavers, Supercat, Supercolour Fabulipstick. Bookmark the permalink.